A one day community celebration of three artists' socially engaged commissions in Swanscombe, North Kent. Everybody is welcome. The Gathering is a one day event which includes an exhibition, performances, walks and workshops, evolving from the socially engaged projects by artists Nicole Mollett, Esther Collins and Siobhan Schwartzberg, (in an afternoon of Bhangra dancing, art, film, music, food, acrobatics and craft) in Swanscombe on Saturday 23 March. Esther Collins is an artist and Cheese Monger, and interested in the links between these activities. She has been meeting people in Ebbsfleetone-to-one and using cheese tasting as a starting point for conversations about skills and interests in both art/craft and food, as well as picking up examples of unusual skills learnt in specific jobs. From these conversations she has been drawing up connections between participants in both new developments and established towns in Ebbsfleet. 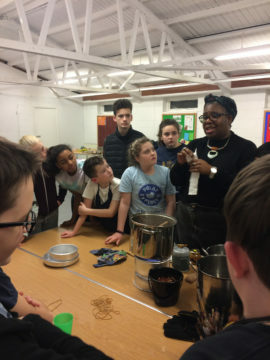 Following these tasting/conversations Esther invited artists Lydia Brockless and Charlene Sandy to devise making workshops for a range of community groups using food and plants as part of the process. Activities included casting vegetables in concrete to make food platters, making natural dyes from plants and then using Japanese Shibori techniques to dye napkins, vegetable block-printing with natural dyes to decorate tea towels and a table runner, using fruit and vegetables to print onto aprons, creating clay slab-cups textured and decorated with drawings of food, and working with graphic design company Work-Form to print letter forms made with plants and vegetables and create a bespoke, useable font called ‘Veggie-type’. Over the course of the commission Esther has worked with the Ladies Craft Afternoon group in Castle Hill, Ebbsfleet Coffee Morning in Castle Hill Community Centre, the Community Farm at NorthfleetSchool for Girls, 1st Northfleet Scouts, the Food Tour Group and Art Group at The [email protected] in Gravesend, and the Community Cafe at St Mary Greenhithe. 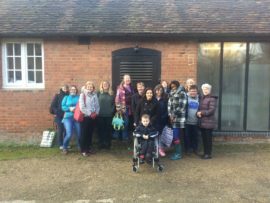 As a way of bringing members of these different groups together the project also involved a trip to visit Blackwoods Cheese Company to see the dairy, the cows and learn how cheese is made. All activities were designed to work together to create a feast-like table display for The Gathering, and bring together everyone who has taken part. During The Gathering event Lydia Brockless will be inviting visitors to make the final element and use food containers and flowers to cast table decorations to display, and to take home. 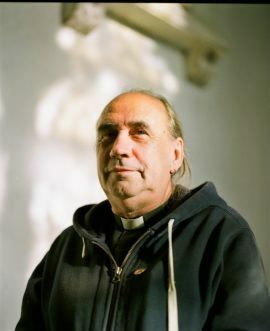 Tales and Tastings is a project about food stories from Swanscombe, Northfleet and Ebbsfleet by artist Nicole Mollett. 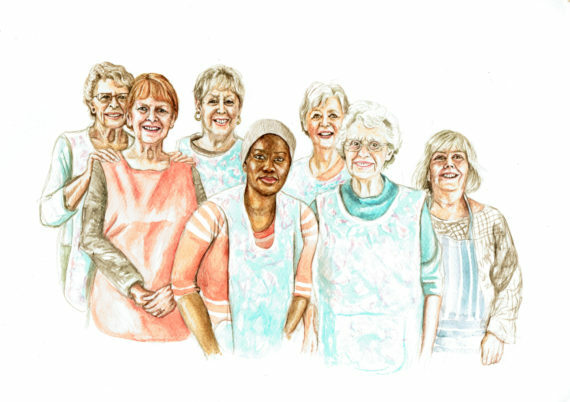 Nicole engaged a wide range of groups including students from Ebbsfleet Academy, Swanscombe Senior Lunch Club, Northfleet Big Local, Northfleet Lunch club, Ebbsfleet Coffee morning, and individual residents, running drawing workshops over the course of several months. Local residents were invited to submit stories and recipes via a postcard conversation. The project resulted in a collection of drawings, recipes and texts which have been brought together in a limited edition publication. 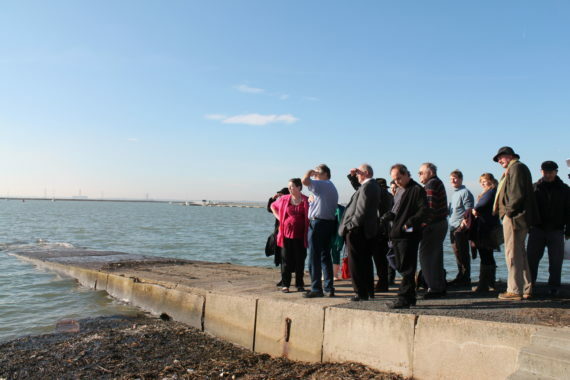 To accompany the event the artist has worked together with local historian Christoph Bull to create an alternative guided tour of Swanscombe. 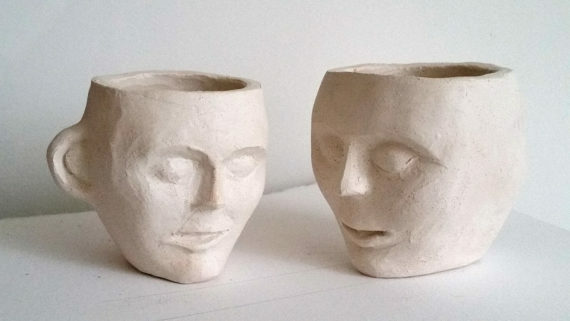 The drawings and some prototype cups and bowls inspired by local architecture will be exhibited. Visitors will be able to taste a selection of the local produce as part of the event. 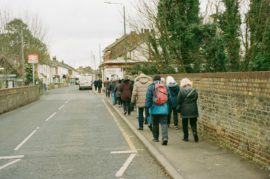 An alternative history guided walk around the town of Swanscombe with tastings, led by Christoph Bull in collaboration with artist Nicole Mollett. Art and History, both address the meanings within everyday life. So why is it the case that most people feel like these two subjects are so distant from them? Is it because these subjects often exclude us from participating? Area Art Archive is a project that focuses on how our everyday lives shape our local history and how we can use that knowledge of our everday lives to create art works that reflect us. History is not something that happens to us, but is something we shape. Art is not simply something we view but also something we influence. This project art work has been created in partnership with residents of Swanscombe, Greenhithe, Ebbsfleet, Dartford and Northfleet.